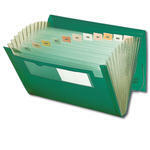 The Emergency File stores critical information that will make it easier to recover in the event of a disaster. Here are some ideas to make sure you can find this information in an emergency. Keep it handy, keep it safe. 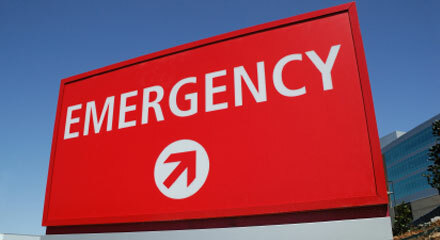 You’ll be better prepared for an emergency and feel safer knowing you can quickly locate your most critical information. Smead recommends uisng a Poly Frequency Expanding File to create a portable emergency file. 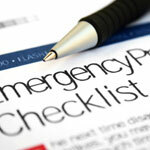 Information can be your greatest asset in an emergency. Contacts, health and insurance information and other critical records can help you react quickly in an emergency. 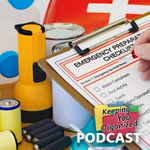 Use a Poly Frequency Expanding File to create a portable file that contains all of the critical information you’ll need in an emergency. Make copies of your most important information; social security, health insurance and credit cards, birth and marriage certificates, deed, wills, bank accounts, insurance policies and prescriptions. 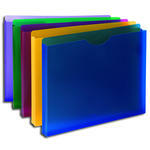 Place the documents in the expanding file. Create categories such as Medical, Insurance, Financial, etc. Write the category names on the tabs for quick reference. Make a list of important contacts. Include addresses, phone numbers and email addresses. Copy important digital files such as photos, video and computer data to CDs or DVDs. Place them in a section of the file. Include emergency instructions or procedures in a separate pocket for quick access. Keep It Handy. Keep It Safe. Protect yourself from identity theft. 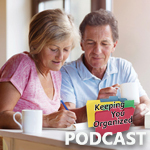 Find a secure location to keep your emergency file. Make sure you can get to the file quickly in an emergency. 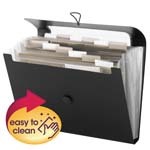 The durable poly file has a sturdy flap and cord to stay securely closed and is easily portable.